Law enforcement personnel including FBI agents are seen March 13, 2018, near a home that was hit with a parcel bomb in Austin, Texas. 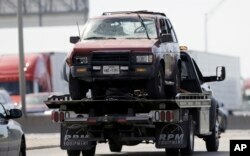 Officials remove a car of the suspect in a series of bombing attacks in Austin from the scene where he blew himself up as authorities closed in, Wednesday, March 21, 2018, in Round Rock, Texas. 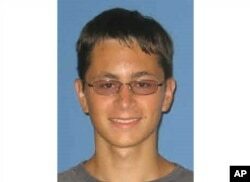 This undated student ID photo released by Austin Community College shows Mark Anthony Conditt, who attended classes there between 2010 and 2012, according to the school.